Immortelle is a European wildflower with some amazing powers and French skincare company L’Occitane hopes to harness the claimed remedy. L’Occitane has created an eponymous line called Immortelle using the flower’s essential oils as an anti-aging treatment. 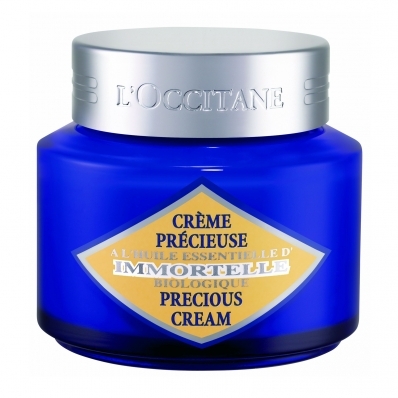 Immortelle Precious Cream ($54, 1.7 oz.) is a thick, heavy lotion or it can be described as rich and velvety depending on your perspective. The ingredients include grape, sunflower, rosemary, evening primrose, soya, and Immortelle concentrate. The cream smells fully botanical; almost like fresh cut flower stems. It claims to smooth and firm skin while brightening the complexion. After four weeks of using Precious Cream twice a day, my skin was more hydrated and softer. I can’t say that it did much to brighten or reduce lines. Since the consistency is thick, or rich, the cream seemed more surface based than a targeted treatment. L’Occitane Immortelle Precious Cream can be used as a day time moisturizer or night time treatment for some real flower power.